ISBN 9783899220957. This book offers eleven duets for second and third-year alto and tenor saxophone students with some experience in sight reading in the common keys. The pieces were composed in extremely varied styles from jazz to Calypso and from blues to French waltz-musette. Apart from learning different styles of music, the pieces have one common goal- to convey the joy of making music in a small ensemble. The duets can be played with either two alto or two tenor saxes, or with an alto playing the upper voice and a tenor for the lower voice. The transposed parts for the tenor sax 2 are printed in a pull-out segment along with the keyboard/guitar chord progressions in two keys appropriate for the E-flat alto and B-flat tenor parts. This format provides both notation and the chord accompaniment for almost any combination of the two saxes, the exception being tenor sax 1 with alto sax 2. 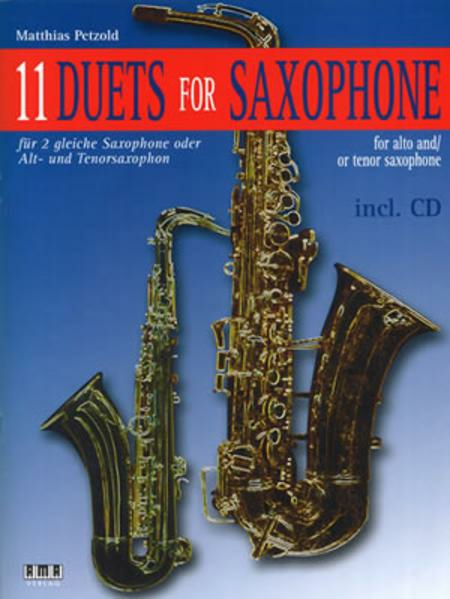 The companion CD offers play-along tracks for both types of saxes. As the two saxophones are recorded in split-track format, one channel can be muted using the balance knob of your stereo, enabling you to play along with either voice on the recording. Due to their melodic and diversified character, these duets are well suited for recitals and often become student favorites. In recital, the duets can be performed with a live pianist or guitarist using the chord progressions provided, or with the piano accompaniment on the CD for E-flat alto lead only. The duets can also be performed effectively by two unaccompanied saxophones.